I had planned to discuss Robert Altman’s McCabe and Mrs. Miller (1971), in the same vein as my earlier discussion of True Grit and Pat Garrett and Billy the Kid, but after wrestling with the post for two days, I realized this film does not fit both of the characteristics I was trying to understand in the others, characteristics I said made them memorable beyond the confines of genre. Awareness of the nearness of death is there all right – in fact there are few movies in any genre where life is cheaper, as shown in the scene where a hired killer shoots a naive cowboy for target practice. What is missing is that yearning-for-what-we-cannot-name, an unrequited longing that I called by its Greek name, Pothos. The characters in McCabe never get that far. They can’t even satisfy their basic yearnings for livelihood, dignity, love, and survival. Some of the modern directors who brought us the western anti-hero and a new and darker vision – people like Sam Peckinpah, Sergio Leone, and Clint Eastwood – nonetheless loved the genre and set about transforming it rather than trashing it. Altman sought to use the western genre to make a point. The year before, 1970, he had used the setting of the Korean war in MASH to reveal the damage modern warfare does to the human soul. 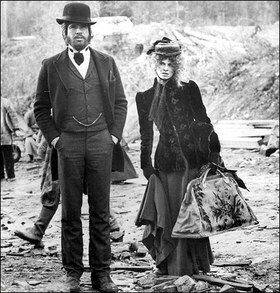 In McCabe and Mrs. Miller, he uses the western genre to make a similar statement about large corporations and unbridled capitalism. He called the movie an anti-western and set out to dismantle the myths. John McCabe (Warren Beatty) is a gambler and would-be entrepreneur with an undeserved reputation as a gunfighter. Constance Miller (Julie Christie) is an opium addicted madam. They form a business and later a romantic partnership to open a high class brothel in Presbyterian Church, a mining camp named for its largest and least used building. The brothel is so successful that representatives of the Harrison Shaughnessy mining company arrive to buy the pair out. Not understanding that this is “an offer he can’t refuse,” McCabe holds out for more. The company sends three hired killers to get rid of him. Terrified, McCabe is able to shoot two of the men in the back from hiding (remember, this was 1971, the Bonanza era, the middle-of-the-street, “Draw, padnah,” era of fairplay in gunfights). He kills the third man but is mortally wounded. In the final scene, McCabe lies dying in the snow while Christie lies in a haze of smoke in an opium den. I tried for two days to find something moving and uplifting in the film, and there is really nothing except the lyrics of three Leonard Cohen songs on the soundtrack. In the opening scene, as McCabe rides into town, Cohen sings, “He was just some Joseph looking for a manger.” If true, that would have lifted McCabe’s story to the level of tragedy, offering some form of catharsis, some purging of our emotions by terror and pity, but I don’t think it happens here. Nothing is purged. Our negative emotions stay with us as they do after a bad episode of the six o’clock news. McCabe and Mrs. Miller is an important western in the history of the genre. It is an unforgettable western and a haunting western, but not for the same reasons as the others I have been considering. This entry was posted in Movies and tagged movies, westerns. Bookmark the permalink.